Executive Vice Foreign Minister Zhang Yesui and First Vice Foreign Minister of the Republic of Korea (ROK) Lim Sung Nam will hold the eighth high-level strategic dialogue between the foreign ministries of China and the ROK in Beijing on June 20. Q: In the EU today, Greece blocked a planned statement by the EU that would condemn China's human rights record. Has China communicated with Greece on this issue or the EU more broadly to block this statement? Do you have any comment on Greece's decision to stop that statement? A: The Chinese side has noted relevant reports. China's position on the issue of human rights is quite clear-cut. We maintain that all relevant parties should conduct constructive dialogue and exchanges on human rights and oppose politicizing the issue of human rights and interfering in the internal affairs and judicial sovereignty of other countries under the pretext of human rights. The Chinese side stands ready to, on the basis of equality and mutual respect, strengthen exchanges and cooperation in the field of human rights with all relevant parties including the European Union (EU) to learn from each other, achieve common progress and make concerted efforts to contribute to the development of the cause of international human rights. Regarding the discussions on this issue within the EU, I don't know relevant details. What I can tell you is that we applaud relevant EU country(ies) for sticking to the right position. 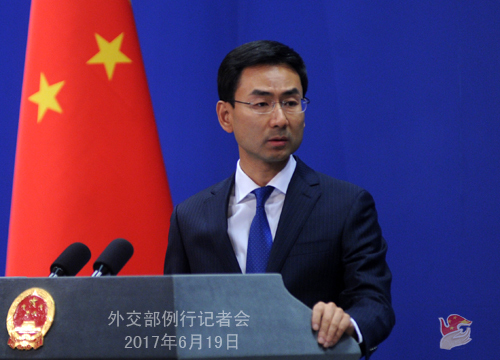 Q: What topics will be discussed at the upcoming eighth high-level strategic dialogue between the foreign ministries of China and the ROK? What are the expectations of the Chinese side on this dialogue? A: At present, the China-ROK relations is in an important period. The two sides will take the opportunity of this dialogue to exchange views on China-ROK relations, the situation on the Korean Peninsula and other issues of mutual interest. 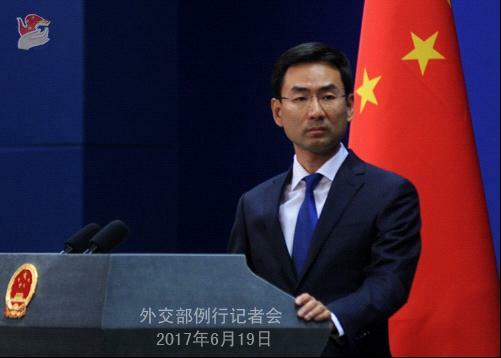 The Chinese side hopes that this dialogue will play a positive role in strengthening bilateral communication, enhancing mutual trust, promoting the proper settlement of differences and improving bilateral relations. Q: Does China has the impression that the BRICS can fill the void the US is leaving in areas like free trade or fight against global warming? A: My colleague released the information on the Meeting of BRICS Ministers of Foreign Affairs last week. The Meeting of BRICS Ministers of Foreign Affairs was held in Beijing today. During the meeting, Foreign Minister Wang Yi met with the press and answered questions. According to my information at hand, the meeting just concluded. The Chinese side will release the relevant information on the details of the meeting. On your question about the role of BRICS countries in international affairs, they are all developing countries and emerging markets with important influence. The stronger exchange and cooperation between the five countries have important implications for upholding world peace and stability, boosting global economic growth, promoting democracy in international relations and improving global governance. The five countries have very strong will in these aspects. Looking back at the past decade, BRICS cooperation has achieved very positive and prominent results. We will work with other BRICS countries to advance the development of BRICS cooperation in a more in-depth way in the next decade. The next BRICS Summit will be held in Xiamen in September. We stand ready to work with various parties for positive outcomes and a full success of this meeting.